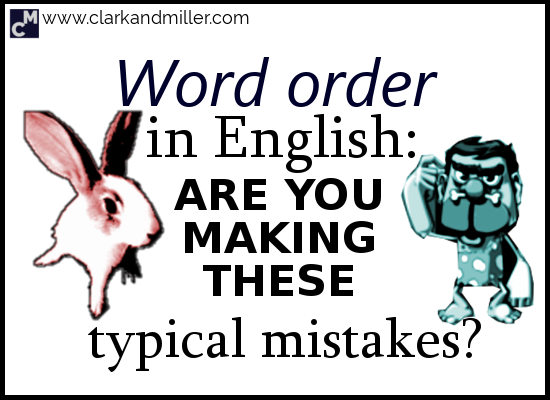 You’re about to find out the 2 typical mistakes that English learners make with word order. Click here for 3 more classic mistakes that learners make. One of the most common mistakes I hear from my students and friends is getting the word order wrong in English. Word order is really, really important in English and sometimes can change the whole meaning of a sentence. Here are the two most common word order mistakes I hear. Are you making these mistakes, too? If so, I’m going to show you how to fix them, and you can thank me. With magic cakes, please. A long, long time ago, I wrote a short post about how you can fix some of your most common English problems with one simple trick. Basically, we can look at sentences in colours. The red part is the verb and the blue parts … aren’t. With this “blue-red-blue,” we can make a basic sentence. But sometimes we want to add “extra information” to a sentence. I met Charles Dickens in my dream last night. The extra information (“in my dream last night”) isn’t grammatically necessary, but it might stop people from thinking you’re a bit mad. In a lot of languages, we can just put the extra information anywhere we like. But unfortunately, English just isn’t that free. To solve this, we need to go back to “blue-red-blue” (and sometimes black) thinking. Well, we also have another type of extra information, which can break the “blue-red-blue” rule. VIP adverbs are usually one-word adverbs. Sometimes, usually, never, often, seldom, etc. Only, just, also, really, etc. Here, there, today, tomorrow, outside and maybe. These ones usually go at the end of the sentence. But where do VIP adverbs go exactly? But not in English, of course. Because English likes to be “different” and uncooperative. Or at least it seems like that, right? Where’s the auxiliary? It’s not there! Confused? Let’s take a step back. Click here for a quick overview of auxiliaries. So where does the VIP adverb go? You guessed it! Right in the middle. What do I mean by “non-action” verbs? I’m very happy with your massive hat. He was a pig, but he’s much better now. All of these sentences use the verb “be” (am, is, are, was, were) without another verb. Notice that there’s no real “action” in the sentences. I kind of consider “be” more of a “half verb” (when it’s used this way). It doesn’t really do anything, right? As you can see, when there’s no other verb, “be” is in the first of the two red parts. So there we are — two classic mistakes that, in a way, come from the same problem. How much do you remember? Let’s see. Can you fix these sentences? I don’t know very well Manchester. We went today to the big castle. He was last year a doctor. Now he makes millions playing Sudoku. We have also a lot of cats. Your beautiful horse made suddenly a loud noise. It sounded weird. Living here also will get boring. Have you been ever to my father’s ice rink? You should — it’s awesome! Did you find this useful? Do you know any people (or squirrels) that might also benefit from this? Then BE AWESOME AND SHARE! Spread the knowledge! 1. I don’t know Manchester very well. 2. We went to the big castle today. 3. Last year, he was a doctor. Now he makes millions playing Sudoku. 4. We also have a lot of cats. 5. You are never here. 6. Your beautiful horse suddenly made a loud noise. It sounded weird. 7. Living here will also get boring. 8. Have you ever been to my father’s ice rink? You should — it’s awesome! 8. Completely on the money! Good work! And thanks for the positive feedback! I don’t know very well Manchester. – I don’t know Manchester very well. We went today to the big castle. – We went to the big castle today. He was last year a doctor. Now he makes millions playing Sudoku. – He was a doctor last year. (Last year he was a doctor.) Now he makes millions playing Sudoku. We have also a lot of cats. – We also have a lot of cats. You never are here. – You are never here. Your beautiful horse made suddenly a loud noise. It sounded weird. – Your beautiful horse suddenly made a loud noise. (Suddenly your beautiful horse made a loud noise.) It sounded weird. Living here also will get boring. – Living here will also get boring. Have you been ever to my father’s ice rink? You should — it’s awesome! – Have you ever been to my father’s ice rink? You should – it’s awesome! These are all exactly spot on! Good work! I like the fact that you added some variations, too. Well, it seems to me that the reason is in feeling the language. Don’t know how to explain. I never use these schemes to remember the structure. But i always hear about them from my daugther. Maybe we learn it while being very little at primary school and now i think that this was in my head from the very beginning. And thanks a lot for your lessons! In fact, I don’t think this approach works for everyone. But it works really well for other people. We’ve all got to find out what works best for us. Also — sometimes, when we’ve learned something, it’s helpful to see it in a different way. It really solidifies the learning. I think I will try to paint it with my 5th-formers)) Thanks for the idea! I’ve never tried this technique with kids, I’d love to hear how it works. Can you let me know?